Android tablets are one of the most multifunctional devices out there. Drawing on an android device is the best way to use their full potential. Making sketches is one of the best ways to relax your mind and showcase your creativity. 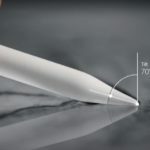 Drawing apps for Android devices have come a long way from being a basic sketching app a few years ago to full-fledged drawing software. They come with all the advanced features which you will find in some of the pro level desktop apps. 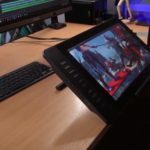 There are free as well as paid apps for Android tablets and smartphones which not only allows you to draw digital paintings but also make simple animations. 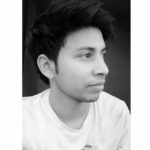 We have made a list of best drawing apps for android which will give you all the tools to express your creativity. They are simple to use and very easy to learn. All the apps mentioned in the list have their own special features and tools. 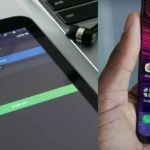 We have tried to do our best to rank them in terms of features and popularity but still feel free to check out the apps at the middle and end of the list, pretty great stuff there. Vector graphics is a great way of making complicated looking digital artwork. They are being widely used on various platforms and gives a very classy and professional look. Adobe Illustrator draw is the award-winning vector drawing app for mobile and tablet. It is the mobile version of the Adobe Illustrator desktop application and supports direct file transfer to the desktop app. The app has 5 main brushes which are fully customizable. It also supports various shortcuts like undo, redo with the help of gestures. Other main features include area fill, stamp shape and eyedropper tool to directly select colors from an image. The app supports multiple layers with full layer customizations such as rename, merge, duplicate, opacity for each layer. You also get access to the Adobe Illustrator Draw community, where you can upload your artworks for comments an critique and check out what others are doing with the app. Autodesk sketchbook is one of the most advanced drawing apps out there. It has almost everything you can ask in a drawing application. The app has a clean layout and with minimal distractions and maximum working space. Its layout makes it easier to draw, even on devices with a smaller screen such as smartphones. 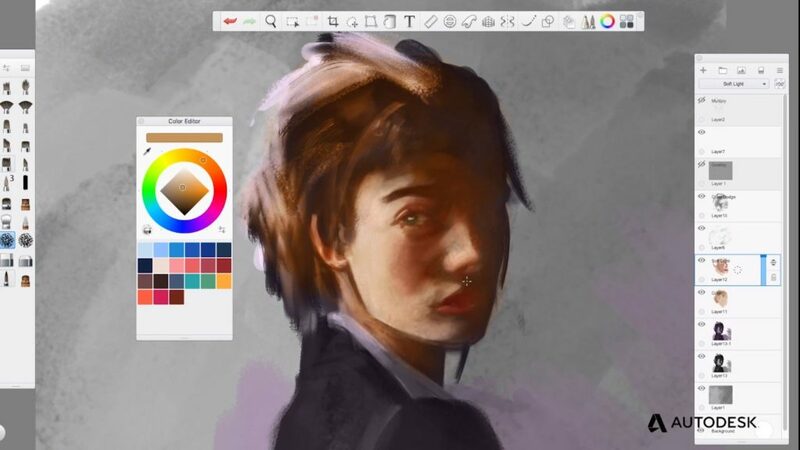 Features – Autodesk sketchbook has the most extensive collection of brushes. Starting from simple brushes to the more complex textured, smudge brush. Each of them can be customized to make it personal. Coming to layers – the total number of layers you get depends on the canvas size and your device. Each layer has basic customization options like opacity, blending, merge, duplicate, blend etc. It comes with a total of 17 blending options as well as HSL adjustment and color balance for each individual layer. The application supports all major file types which includes TIFF, BMP, GIF, JPEG, PNG, and PSD. You can directly import PSD files into the app with all its layers. These extensive set of features along with all the other capabilities make it one of the best drawing apps. 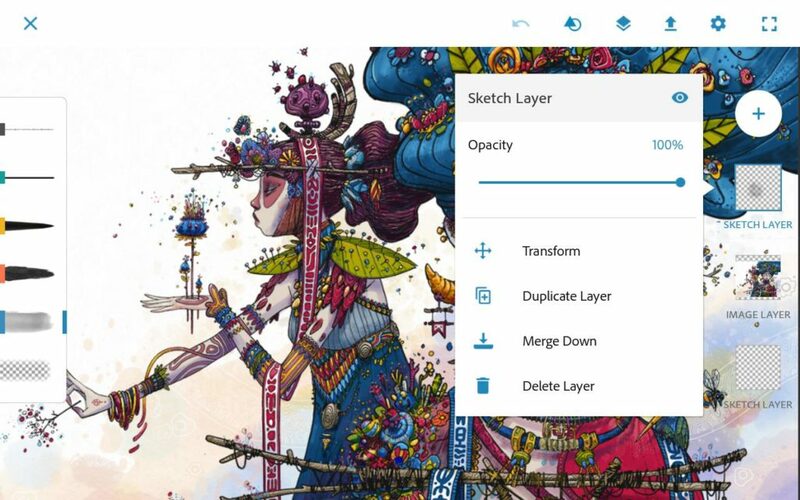 Moreover, Autodesk Sketchbook is available for all devices and all platforms. There is a free version of the app available along with a 7-day trial, you can upgrade to get more features. Medibang paint is one of the common android apps for making manga and comic art. It is one of the most extensive applications with more than 1000 different brushes. Not only that, it comes with preloaded fonts, premade backgrounds and a ton of other resources. The app also has a desktop version. The Android version of the app allows the illustrators to draw anywhere on the screen while retaining all of the features of the full desktop app. The app comes with very handy tools to easily allow creating comic panels along with advance page management which arranges all the pages of your comic at one place. Medibang paint has cloud synchronization which enables you to transfer and open files at your mobile, tablet, computer or a laptop. The app is totally free to use and has all the essential features which will you find in any major drawing app. You have the full layer controls along with drag and drop as well as transform features. In spite of having all these features Medibang paint is a lightweight app and can run smoothly on slower-older devices. Photoshop is the most well-known applications out there and quite a big programe in itself. If you use photoshop for making digital sketches and artwork, you will find yourself very comfortable with this app. In a nutshell, Adobe Photoshop Sketch is a cut down version of the photoshop desktop app and has only sketching related tools and features. You will find a set of different types of pen, which includes pencils, pens, markers, eraser, thick acrylic, ink brush, soft brush and so many others. On top of that, you can also make your own custom brushes using Capture CC. The app has a minimalistic layout with selected brushes on the left and layers at the right-hand side of the screen. The extra menu options are available on the top. In the center, you have the main drawing area. In case you want more space all the brushes and menu can be hidden with a single click. The drawing file along with all its separate layers can be opened in Illustrator or photoshop android or desktop application. You also get access to the Adobe community and so many online tutorials. Many of the drawing apps which aims for minimalist design tends to oversimplify their layout so much that it becomes difficult to navigate. On the other side, some apps overcomplicate things and make the app crowded with buttons. If you are someone who likes to have as many shortcut options at your fingertips without losing precious working space, Ibis Paint X is the most suitable app for you. The app is mainly focused around small devices and have features like stroke smoothing and optimizing which allows you to draw accurate strokes even with your fingers. The overall layout very much looks like a desktop-grade drawing application with important tools on the left. There are handy menus at the lower end of the screen which allows you to control pen size and stroke properties. The app has 142 different kinds of brushes and allows you to work with as many layers as your device can handle with virtually no restrictions. It also has other handy features like clipping images, layer duplication, import from Gallery, horizontal inversion, vertical inversion, layer rotation, layer moving, and zooming in/out. Many drawing apps in the market focus on shiny things and try to implement so many weird features that most of the artists end up never using them. Infinite Painter is one of those apps which have nailed down the basics so well that it is becoming very popular amongst pro artists. So what do the basics actually mean and how it affects the painting. Things like blending colors and different brush strokes are some of the very basic things a drawing app needs to do well. Infinite painter has all of those basic features implemented correctly. It has great perspective guides to help you build futuristic cities and landscapes. Their brushes consist of paintbrushes that correctly mixes with the colors on the canvas and various watercolor brushes apart from the usual basic texture brushes you will find in all the main drawing apps. In a nutshell, the app is capable of making some really good artwork. You can go and have a look at their art gallery, which will surely inspire you to get your hands dirty and make some really great art. There are so many great apps which are hidden from the spotlight but still has a lot of great features, Tayasui Sketches is one of them. It is kind of a beginner friendly simple drawing application with some of the most simplistic layouts. The layout is best suited for the tablets and consist of a set of brushes and few tools on the left-hand side of the screen. In the same area, you get options to do some basic brush settings. All the layer panels and settings are located at the right side. The opacity and size settings of the brush are located on the right edge of the canvas. There are different kinds of brushes to choose from which includes simple pen, pencil, markets to pattern and texture brushes. Within each brush set, you will find extra brushes with different shapes and functions, neatly organized without blocking the canvas. The app has an active community where you can share your artwork and see what others are creating. 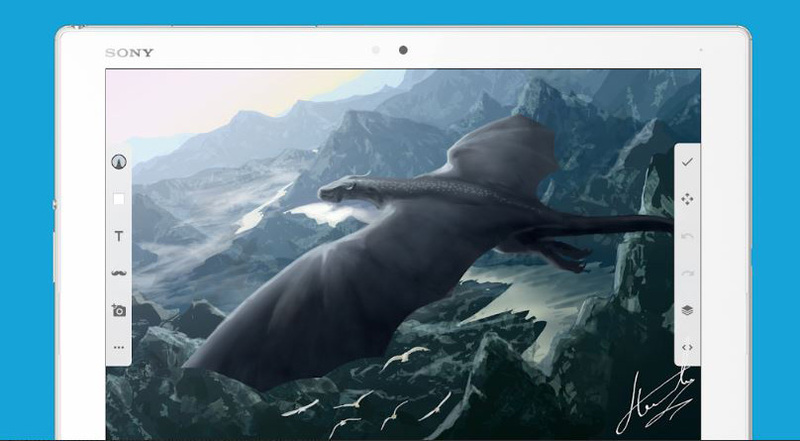 Artflow is a lightweight drawing application specifically made for android devices. The app has a beautiful layout which makes it easier to work on mobile devices. For mobile and tablets, you have layer panel on the right and brush size and opacity on the left. Overall you get the set of 100+ brushes and more than 50 layers with different blending modes. The app also supports pressure simulation for touches. There are various types of selection options and clipping masks which makes it easier to paint. Each layer has more than 10 layer filters which include HSV adjust, brightness & saturation, color curves and more. 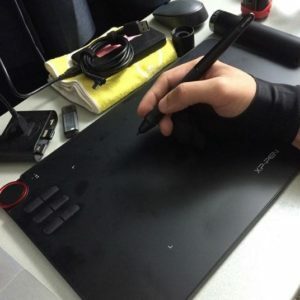 There are some of the features like palm rejection which further improves the drawing experience. It has more than a million downloads on play store with a very positive response from the artists. Ever felt intimidated with big drawing application with their layer mask, HSV color adjustment, Stroke enhancer, advanced blending, filtering, and so many other big features. These tools are great for pro artists but what if you just want a simple drawing application without any confusing titles. Papercolor is aimed at beginner to intermediate artists and proves that you don’t need fancy features for making good art. The app comes with preselected simple and essential tools which are aimed to imitate real paintbrush. There are just a few simple brushes with a slight variation. The brushes and all the other tools can be accessed from the bottom tray. The app is mainly focused on mobile devices but also supports tablets. It is perfect for drawing doodles and graffiti. If you have observed closely, you would have noticed that for some reason or other, digital art looks different from the traditional art. Most of the drawing applications heavily lean on modern looking art style with clean lines. If you are coming from a traditional background and have been drawing on paper than Artrage is the most suitable app for you. The main focus of the app is to simulate the real brush strokes and realistic blending and smearing. It results in a painting which looks and feels as it was drawn on a canvas rather than a screen. Oils, Watercolour, and Palette Knives let you smear paint, blend colors, and easily create natural textures. 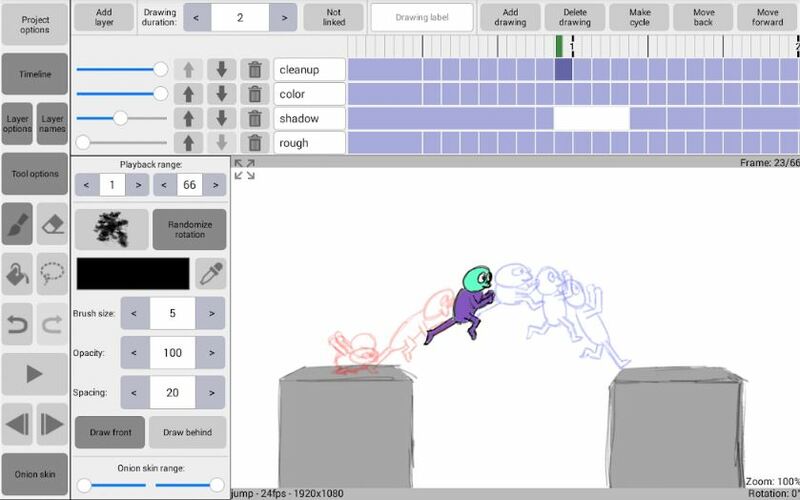 There is an option within the app to record your drawing process to make it into a tutorial. ArtRage Paintings are fully compatible with desktop versions of ArtRage and can be exported as PNG and JPG images. Want some inspiration, you can have a look at their art gallery. 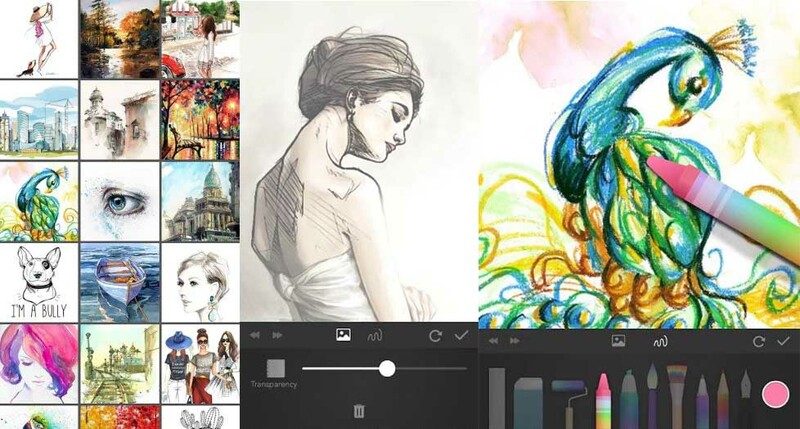 Sketch is a two in one drawing and photo editing app made by Sony. It comes with all the basic features which you can find in other apps. There are several sketching brushes along with layer support. You also get a lot of free stickers to use in your sketches and pictures. Others features include move, scale, rotate, and flip, Pan and zoom. The app allows you to backup your sketches and sync. with other devices. Overall it is a fun app used mainly for casual doodles. Rough animator is more of an animation app than a drawing app. If you ever wanted to make simple animations on an android device, this is the best app for the task. It has a very simple and easy to understand layout. The app helps you to make the frame by frame animation and the end result looks surprisingly good. The app not only allows you to make animations but also has an option to import audio for lip sync. You can also import video files in the timeline for rotoscoping. For reference to the previous frames, you have the onion skin feature as well. In drawing side of things, the app has some basic brushes and supports pressure sensitivity. You have options like area fill and object selection to make the coloring process easier. You can also copy and paste objects within the canvas. This app works best with the tablets as you have more screen real state to work with in comparison to smartphones. 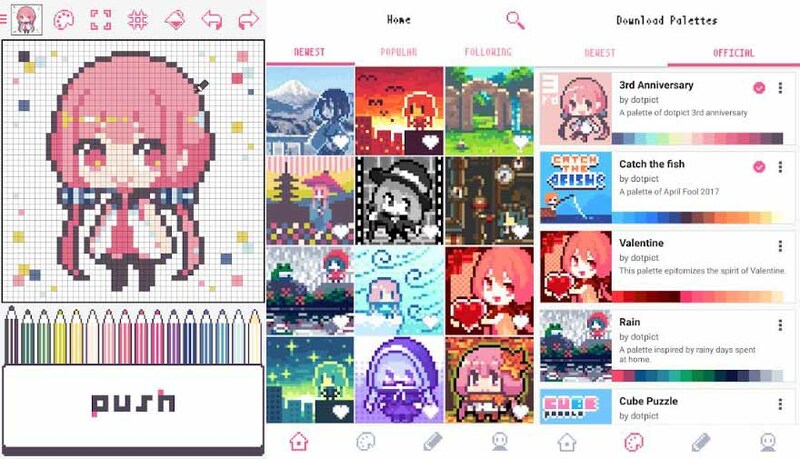 Dotpict is a pixel-based drawing application which makes pixelated art. It is one of the simplest apps in terms of layout, design, and features. You get a single brush with a few selected colors. Using this app is kind of like challenging yourself. Layout – On the top bar you get few menus to perform some very simple tasks. Right below it is the drawing area, which comes in a square shaped canvas by default. Which is followed by a set of different colored pencils and at the end we have the push button. How to use – Basically you zoom in the canvas, select the pen with the right color, aim at the right box and hit the push button at the bottom and boom you get a pixel. Repeat the same steps until you get something recognizable.